The government’s Help to Buy equity loan is available for people who want to buy a new build property – and it’s interest-free for the first five years. All potential and existing homeowners are eligible, as long as the property is a new build, it’s valued under the set price cap (currently £600,000) and you have at least 5% saved for a deposit. With a Help to Buy loan, you can borrow up to 20% of the value of the property, which means that you could buy a home with just a 5% deposit, and a mortgage for the remaining 75%. In London, the rules are different and you can borrow more. The scheme opened on April 1 2013, and has been extended up to 2023. It’s important to be aware that on April 1, 2021, the scheme is being restricted to first-time buyers only and new regional price caps will be introduced (outlined below). These changes mean that anyone who already owns a property and hopes to benefit from Help to Buy must do so before April 2021. What about Help to Buy in London? Because house prices in the capital are so much higher than the rest of the country, the Government introduced a London version of the scheme which allows you to borrow up to 40% of the property value as an equity loan. This means that after saving a 5% deposit, you would need to secure a mortgage for the remaining 55%. Apart from this difference, the scheme works in the same way as standard Help to Buy described above. 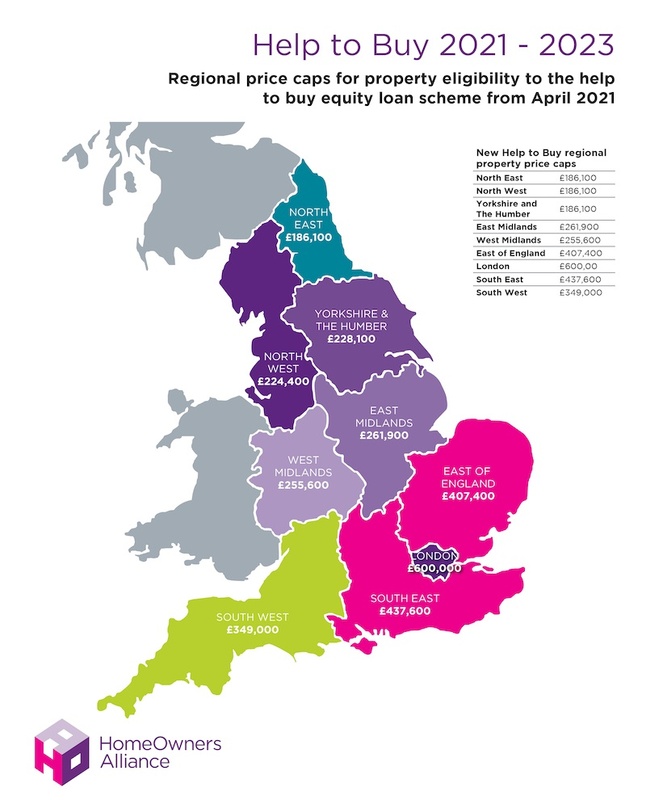 From April 2021, and until its end in March 2023, Help to Buy equity loans will only be available to first-time buyers – and will be subject to regional price caps. These caps are set at 1.5 times the current forecast regional average. What restrictions are there with Help to Buy? How do you repay Help to Buy? Since the Help to Buy loan is interest-free for the first five years, it’s advisable to repay as much as you can before this period ends. You can make part repayments, known as “staircasing”, to reduce your ongoing costs when the interest-free period ends, and to start paying off the equity you’ve borrowed. Staircasing will also mean that you’re entitled to a greater share of the total sale proceeds when you sell. After the interest-free five-year period, you may want to remortgage and either keep the equity loan from the government, or use a new mortgage to repay the Help to Buy loan. The latter option will increase the size of your standard mortgage, but you’ll find more lenders and options available to you. Some homeowners will choose to remortgage and repay the equity loan because it means they will benefit from any increase in value – but they should beware that it may mean the monthly mortgage repayments go up. If you want to remortgage, you’ll need to pay a £115 administration fee to Homes England. Homes England’s Mortgage Administrator will need to approve any increase in your first charge mortgage. When paying back the equity loan, either through staircasing or when you come to sell your home, the sum you owe will depend on the most recent valuation of the property. Not all lenders offer mortgages on Help to Buy homes. If you want to remortgage to get a better deal, while keeping the Help to Buy equity loan, you’ll find a much smaller range of products available to you. Can I sell my Help to Buy home? You can sell your home bought with the Help to Buy equity loan at any point. If you still owe money on the equity loan, this will need to be paid from a share of the sale’s proceeds. For example, if Homes England assisted your purchase with a 20% contribution, your repayment will be 20% of the total market value when the home is sold. You should be aware that if the value of your home has increased, the amount you need to repay will also increase. For example, let’s consider a home worth £200,000 and bought with a 20% government equity loan worth £40,000. If the value rose by 10% to £220,000, the amount borrowed would also grow by 10% and you’d need to repay the government £44,000 – an extra £4,000. However, if the value of the home falls, then the amount you owe would also fall. Is the Help to Buy scheme right for me? You will benefit most from this scheme if you can pay off the equity loan within the first five years, before the interest kicks in. You need to ensure you’re able to afford a capital repayment mortgage alongside the fees and equity loan repayments (see our guide Mortgages made simple). Interest only mortgages won’t be available for people buying with this scheme. Just because this is a Government scheme it doesn’t mean you’ll get any more protection. It is your responsibility to keep up repayments on the mortgage and equity loan. If the home you are buying is leasehold, make sure that you ask your conveyancer to scrutinise the contract and look out for any onerous terms such as escalating ground rent. See our guide for more on leasehold problems. Which properties are eligible for Help to Buy? Shared ownership is a different scheme that allows buyers to own a share of a property while renting the rest of the property from a housing association or developer. It’s important to get independent financial advice before you apply for the Help to Buy scheme, as there may be another option that is better-suited for your personal circumstances. You can talk to mortgage broker London & Country for free on 0800 073 2326. Complete a Help to Buy “Property Information Form”, available from the house builder. Send the signed Property Information Form and a copy of the builder’s signed reservation form must to the Local Help to Buy Agent. You’ll then need to go through the new build conveyancing process, and your conveyancing solicitor will need to liaise with the Help to Buy agent at a few key points when you’re buying your new home. After 2 years into the help to buy scheme we have decided now is the time to repay the loan but we are finding the cost of doing so prohibiting. Although there may not be any “fees” the cost of getting a valuation plus solicitors costs and administration fees this could amount to approximately £1,800. This was not explained at the time of taking out this loan. What is that other 1% as when I have asked that question specifically to an HTB financial advisor they assured me it would only be the 1.75%? WHAT DO I NEED TO OBSERVE AND ASK FROM HOUSING ASSOCIATION SURVEYOR? WHEN CAN I REQUEST AN INDEPENDENT SURVEYOR OUTSTANDING REPAIRS REPORT? HOW CAN I ENSURE ACCURATELY MY FLAT IS SURVEYED FOR GOVERNMENT HOME BUYING SCHEME- DISCOUNT ON PURCHASE BASED ON TENANT YEARS OF MAINTAINING TENANCY? DISCOUNT % REDUCING THE PURCHASE DISCOUNT? I AM CONFUSED BY SURVEYORS AND THEIR ROLE IN THIS PROCESS. PLEASE CAN YOU ADVISE, DIAGNOISIED IMPAIRMENT IMPACTS ON THE ADJUSTMENTS REQUIRED FOR MY PLACE TO LIVE. I have just read through your guide and part way through it starts writing about new-build properties. Is this scheme for new-build only and if so wouldn’t it be best to say that at the outset? I’m hoping to learn more about prepayment penalties for equity loans. Are you able to explain? We have come to the end of the 5 years and we are now eligible to repay the builders and government loan. We were given a 30% loan through that method however this has since been sold on and interest alone is £75 a month without paying off any equity. This has not enabled us to pay off within the secondary 5 year window as recommended above. What recommendation is given with these circumstance changes? If I repay equity loan early, e.g. after 4 years, will be the amount recalculated as well? If house price will rise in these 4 years?